Excluding French fries and potato chips, some health experts consider potatoes superfoods. Unfortunately, the stigma of spuds remains; their health promoting and nutritional aspects are mostly unknown, buried in misinformation and partial facts that scare most consumers away. 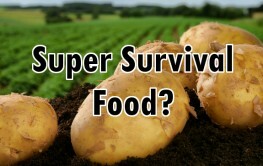 There are rising concerns about potential food shortages in this free fall economy. The fact that nutritionally dense potatoes store well and are easy to grow year around in small lots, even flower boxes, puts potatoes high on the survivalist list. Lots of Nutrition. Even Protein and Vitamin C! Too much attention is paid to the starch content and somewhat high glycemic index of potatoes, which is manageable unless diabetic. What’s ignored is the fact that potatoes contain all 22 amino acids to form complete proteins after easy digesting. It makes for easier protein absorption than the digestive effort of breaking down the complete proteins in meat and dairy as well. Potatoes are a high source of potassium, even more than bananas, and are rich in other minerals too. They are also rich in Vitamin C and B6. Agricultural Research Service plant geneticist Roy Navarre has identified 60 different kinds of phytochemicals in the skins and flesh of a wide variety of potatoes. Some potato phenolic levels rival those of broccoli and spinach. Others contain high amounts of folic acid, quercetin, and kukoamines. Only one other food contains all three of those compounds – gogi berries. Potatoes are antioxidant dense as well. Some say the skins are poisonous, even though they contain a high concentration of nutrients. Those concerned about the skin are alluding to a poison inherent in the potato’s leaves and stems to ward off foraging animals and insects, the alkaloid solanine. Cultivated potatoes don’t have that risk unless part of the skin is green or sprouts have begun to form. When you see either, it’s wise to avoid that potato, despite it taking a hefty amount of solanine to experience an immediate toxic reaction. Eating skins is recommended if not wrapped in foil while baked. Use only organic potatoes and keep them in paper bags or open containers in cool, dark dry places to prevent green skin or sprouts from forming. Their shelf life is long if they’re not mixed with onions. Also, don’t refrigerate uncooked potatoes. Combining potatoes’ comfort food satisfaction with their protein forming amino acids, vitamins, minerals, and especially disease preventing phytonutrients and antioxidants makes them an easy choice for growing and storing as a survival food. A couple of years ago, Chris Voigt went on a 60 day potato only diet to prove their nutritional value. His interview is here. British rule prohibited Irish Catholics from entering the professions or owning land. They had to rent small plots (survival clue) from Anglo-Protestant owners and grow potatoes to survive. Many types of potatoes can be grown in small areas most of the year. You can find out more by Googling “home grown potatoes” and “planting potatoes”. as long as they are organic. I understand that potatoes are very good at cleansing soil and absorb toxins. I learned this from a friend who had been researching potatoes at my local university about fifteen years ago. He encouraged eating only organic potatoes. Sorry that I can’t cite the study. Finally! Someone who does not demonize the potato! Who are these mysterious “experts” you cited? Why do you people use the trendy term “superfood” for everything under the sun? Yeah, potatoes are great. Super. Let’s not go overboard here.